Salt potatoes are bite-size "young" white potatoes scrubbed and boiled in their jackets. Salt is added to the water to the point of saturation, giving them their name, and unique flavor and texture. 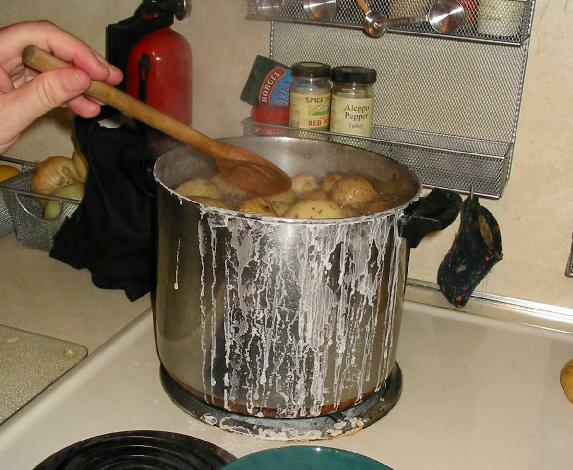 After cooking, salt potatoes are served with melted butter. Salt potatoes are a regional dish of Central New York, typically served in the summer when the young potatoes are first harvested. They are a staple food at fairs and barbecues. In this region, potatoes specifically intended to be made into salt potatoes can be purchased by the bag along with packages of salt during the summer months. Because extra-salty water boils at a higher temperature, the starch in the potatoes cooks more completely. That’s why salt potatoes are so creamy. And the salty skin that forms on the outside of the potatoes stands up particularly well to herbed or even plain melted butter. Many recipes call for a ratio of four pounds of potatoes to one pound of salt. Bring salt and water to a boil and add potatoes. Cook until tender, about 25 minutes. Drain potatoes in a strainer and place pot back on stove over medium heat and add butter. When just melted, after about a minute, add potatoes and, if desired, herbs and black pepper. Toss and serve immediately.